My all time favorite Tomi Ungerer book was reissued by Phaidon this past summer. The Beast of Monsieur Racine. My original post on the book from 2010 is here. The new book is here. My interview with Tomi is here. And it's still not too late to order it in time for Christmas here. Sooooo without further yadda yadda yadda, I will be giving away one copy of this magically creepy and fabulously wonderful book. To be entered to win a copy, simply comment on this post by 11:59 PM CT Wednesday, January 7. The winner will be announced the next day!!!! This book was sent to me by the publisher to giveaway, but I don't think I need to tell you that this in no way educated my opinion of Phaidon, this book and/or the level of pure swank of either. Lovely book- really enjoyed the documentary about Tomi as well. I would love to read this book and pass it along to my nephews! Would love to share this with my little ones! This book looks very interesting...I would love to look and find all the fun and strange things! I would love to read this one to my girls! I would love to read this to my class! Love your blog and love the books! I hope to someday be a children's book writer and illustrator! love it!Now I know I am in Dublin, but I'm not asking for it for me but for my brother in San Diego who was 50 during the week. I am not familiar with this book but I'm sure it's great, as it comes so highly recommended by you. I've been following this blog for a couple of years now and I love the glimpses into these marvellous vintage books you choose, many of which are unfamiliar to me. We used to watch animations of Ungerer's books when we were kids. This and The Three Robbers were my favorites. I can still hear the readers' voices in my head as I read these books now to my kid. All the Tomi Ungerer's I've read are great. I've never read this one though--would love to win it! We'd love to read this. Awesome! We'd love to ad a copy to our home library. We love the weird. And the nose on that fellow is terrific! I don't know what is in store but so far, this is the best re-print! It was a favorite book of mine, so loved it fell apart. I've never been able to find a copy of this one. I'm really glad it's been reprinted! Hooray! I'm so glad that I decided to drop in on your blog this evening. This book is new to me, and we'd love a copy. I just got myself Allumette for Xmas, is it greedy to hope I win? 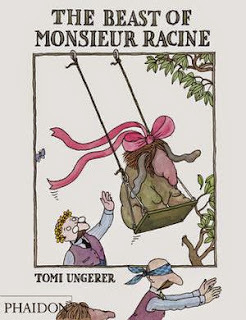 I haven't met a Tom Ungerer book I didn't like, and I haven't read this one! Would love to read it to my boys.